The first time I was introduced to Korean food was about twelve years ago when I first relocated to New York from Brazil. I was working for the YWCA in Flushing, Queens (I was one of the few non-Asians there) and they were celebrating Chuseok, the country’s version of Thanksgiving, which happens early in October. Since I have always been very open to new foods, I sampled some dishes , but when I saw this reddish pile of vegetables, I asked what it was. “Korean salad,” said a lady with limited English skills. I took a mouthful and gasped – it was really spicy! 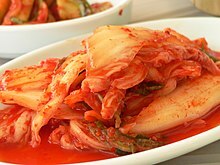 Later, I found out that it was kimchi, a side dish (Koreans pride on their sides) made from picked napa cabbage, red peppers, garlic and other spices that are aged for about a month before it is ready to be served. After that first experience, I started going to Korean restaurants in Queens – among them Chung Ki Wa (4006 74th St, Jackson Heights, NY; 718-478-0925 , no website) a nice little place in Jackson Heights a few blocks from a place I previously worked at. There I learned more and more about the food, and frequently talked to my Asian students about preparation and all, until one of them actually gave me a cookbook as a Christmas (or was it birthday?) gift. Korean food is very laborious, but the final result is very satisfying. For instance, bi bim bop (rice, marinated vegetables and optional meat) requires patience since all the vegetables need to be steamed separately and then arranged over rice, while to make kim bop (rice rolls) you need to have the skills of a sushi chef. There are dishes that are simpler to make, such as chap chae (clear noodles with vegetables and/or meat) or pajeon (crispy fried pancake with seafood), but the best ones are the ones that take a lot of work. One thing about Korean food is that is relatively healthy. There are few fried dishes, and most are either steamed or boiled. The fare is very spicy at times, but there are many mild dishes to try for those who don’t want a burning palate. I have made some Korean dishes at home over the years, but not that frequently. When I am craving those dishes, I head to W32nd street (Little Korea Street) where there are many restaurants, bakeries and even a small supermarket. My personal favorite is Woorijip (12 W 32nd #4 New York, NY 212-244-1115, no website), where they have an array of packed foods, lunch and dinner buffet and also a noodle bar. The prices are great, and since it’s so centrally located (and close to the places where Renata and I work), we often sit there, eat well and drink some soju and bek se ju (Korean rice wine) without having to break the bank in the process. Recently I met a legendary Brazilian singer from the post-bossa generation and told her about the place. She got curious and went there with me. She immediately fell in love with the place and the food, and on the next day she was calling me for the address so she could tell her friends to meet her there for lunch – I guess I converted another person to the wonders of Korean cuisine. If using sesame seeds, add them at finish.